I was browsing in an antique shop about fifteen years ago, when I saw this Norman Rockwell collector’s plate in a display. This little girl, with her hair done up in curls and pins, with blotchy rouge and smeared lipstick, touched my heart. I wondered something about this plate…I turned the plate over, and on the back, I saw what I had been looking for. This plate was part of the Rediscovered Women series, the series my mother was collecting. I was so excited to find it! Of course I couldn’t pass it up, and I bought it as a gift for her. It now hangs in the bathroom at my parent’s house, next to the mirror. One of the reasons I love Norman Rockwell illustrations is how well they relate to our own memories. What little girl hasn’t gotten into her mother’s make-up drawer and played dress up? I thought I had the perfect picture of my little sister and cousin from the ’80’s, when they were about 3 and 5 years old, wearing bright applications of lipstick and blush. Unfortunately, I couldn’t find that photo. So I have to make do with this photo, instead. Lily had just turned three, and we took her to the children museum, where they have several stations for children to paint their own faces. 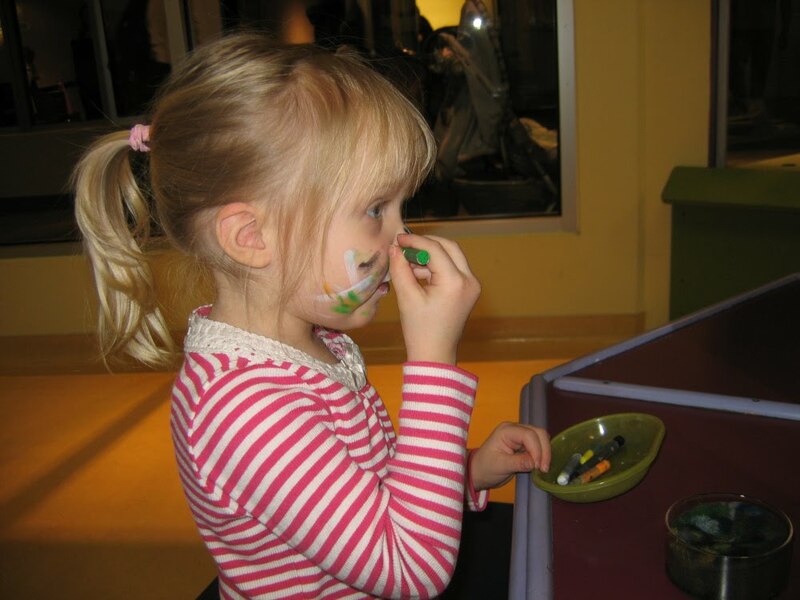 A visit to the museum isn’t complete without a visit to a face painting station! For more memories, visit LT at A Day With Two for Take Me Back Tuesday! That museum sounds like so much fun! I've never heard of a museum with face painting stations. 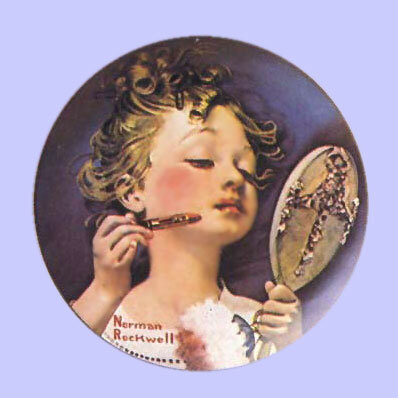 There is just something little girls find fascinating about Mom's makeup isn't there?I just love Norman Rockwell's stuff, I haven't seen that one before, it just fits our life right now!! What a gorgeous plate! I remember playing with my mom's lipstick when I was little. Our Siamese cat loved licking lipstick off so I would put it on just to feel her scratchy tongue lick it off!